PRODUCTION ARTS: Theatre, Film and Media – CAPA College (Creative and Performing Arts College)…excellence in Arts training & education. The Production Arts: Theatre, Film and Media course pathway provides training and education for students wishing to pursue a career in Design, Technical Theatre, Media or Production. The exciting ‘hands-on’ course combines vocational, practical training with academic study. In Year 1 the course offers a broad range of training in all aspects of Technical Theatre, Design and Media in theatrical, film or live-event contexts enabling students to explore a rich curriculum learning new skills and expertise. In Year 2 students can specialise, hone their skills and develop depth of knowledge, understanding and expertise in their chosen area of interest leading to students progressing to higher education or straight into Arts based employment. Students will learn a wide range of technical skills and training from CAPA College’s resident team of specialist teachers, designers and technicians as well as from regular visiting industry experts – from set construction techniques to sound recording skills; lighting operations to video editing skills. Creative development is also an essential part of the course pathway and students study design and concept realisation with the opportunity to gain experience in designing lights, sound, set, costumes, AV, animation and video production. Training leads to students gaining extensive live operational experience in a range of venues giving students opportunity to learn how to adapt to different spaces and operating systems. All students participate in work placements, gaining experience in the professional industry and focusing on their particular area of interest. The vocational focus of the qualifications means that all work and performance opportunities (including all ongoing participation in classes and rehearsals) are assessed. At the end of the course, students will be awarded an overall grade according to the combined total of all the individual units. 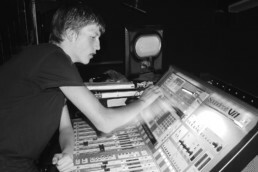 Now studying BA (Hons) Creative Lighting Control at Rose Bruford College of Theatre and Performance.